I would be lying big time if I told you that this is something I grew up eating. I did not, and it was never ever cooked at home by maa. We only ordered Palak Chicken (another name it goes by) when we ate in restaurants. But as years went by with me trying out different things in my kitchen, this has become a favorite. While Palak Paneer still scores higher than any spinach recipe, Palak Chicken/Murgh Saagwala/Spinach Chicken is a welcome change at home. Saag in Hindi refers to any leafy greens. Palak is spinach. So Palak is a Saag, but all Saag is not Palak 🙂 Have I confused you yet? Even though Spinach Chicken is something we have had very infrequently while growing up, I remember the first time I ever tasted it. We were staying in a hotel for the night before we were taking a flight to some place and the person who took the orders for the dinner coaxed us into trying the Spinach Chicken. When we finally tasted it, we rolled our eyes and marveled at the mellow but the fragrant thick spinach sauce, and loved it of course! When I first started making this at home, I used to add half the amount of spinach and half fresh cilantro as A detested the mushy spinach and the flavor. The fresh coriander/cilantro was kind of a fooling agent and the spinach went undercover. Gradually I started reducing the amount of cilantro until everyone got used to just the spinach. Even now I add kasoori methi or dried fenugreek leaves for the flavor. But it is not really required. I love this dish best with the little tart Pickled Onions. 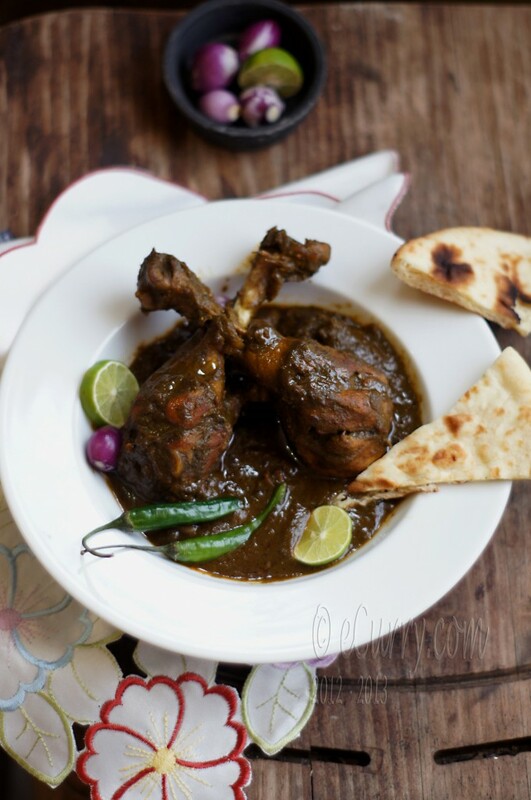 A bit of the Murg Saagwala with Naan or rice with a bite into the mellowed onions and perhaps a hot pepper is bliss. Wash and clean the chicken. If you are using big pieces like drumsticks or breasts, make multiple deep incision/slits in the flesh of the chicken. Pat dry. Combine salt, lemon juice, red chili powder and turmeric in a ziploc bag and place the chicken in the mix. Let the air out and close the bag and rub in the marinade to the chicken pieces making sure all the pieces are coated well on all sides. Refrigerate the bag for at least 2 hours or even overnight. 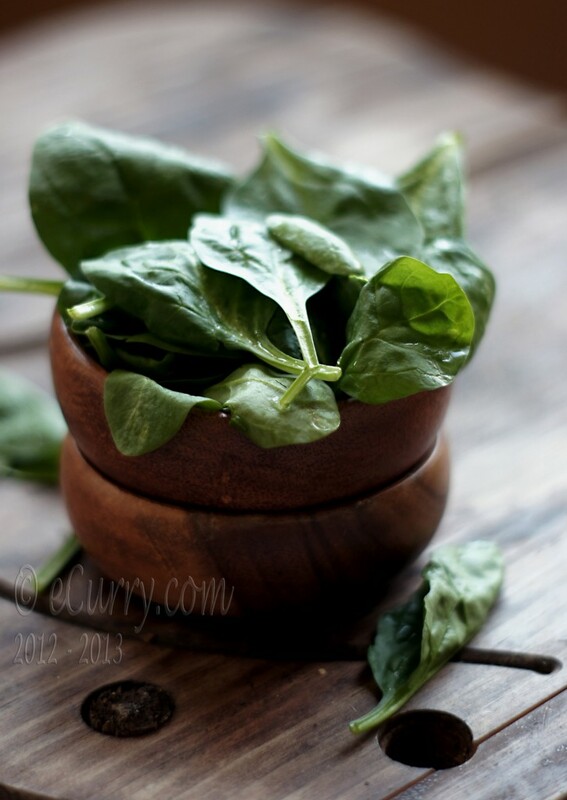 Boil spinach in boiling water for 2-4 minutes. Plunge them in ice cold water right after. Drain the leaves and grind/puree spinach 9and fresh cilantro if you are using) and green chillies together. Try not to add any extra water. Set aside. Grate/puree the tomatoes. Combine salt, turmeric, chili powder, kasoori methi if you are using and stir them in. Set aside. Puree/blend ginger and garlic together; set aside. Coarsely pound the cardamoms, cinnamon, clove and black pepper. Place the spices in a thick bottomed, wide based pan (large enough to hold the chicken pieces in a single layer) and heat the pan. As the pan heats, the spices will start getting fragrant. Add oil to the pan and allow it to heat up. It should not take long. When the oil is hot and it shimmers, add the cumin seeds. When the cumin seeds sizzle, add the chopped onions and cook at high heat while stirring occasionally until they soften and are all golden brown – about 5-7 minutes. Add ginger and garlic paste to the pot, stir everything together and cook for a minute. Remove chicken from the marinade (discard the marinade) and add them to the pan in a single layer. Cook on medium to high heat, stirring to scrape off the bottom of the pan until the chicken is light brown with darker brown spots on all sides. Add the blended tomato and cook covered (stirring occasionally) until the chicken is almost done and almost falling off the bone. It will take about half an hour to forty minutes. You will see the oil separating and surfacing up. Add the spinach and chili paste, stir everything in and cover tightly and cook until the green paste is completely blended and coats the chicken pieces – about 10 – 12 minutes. Uncover and add the garam masala powder and the ginger strips and stir it in. Cover it back again until ready to serve. Keeping meat uncovered will dry out the flesh and will lose the tenderness. Sprinkle lemon juice when ready to serve. 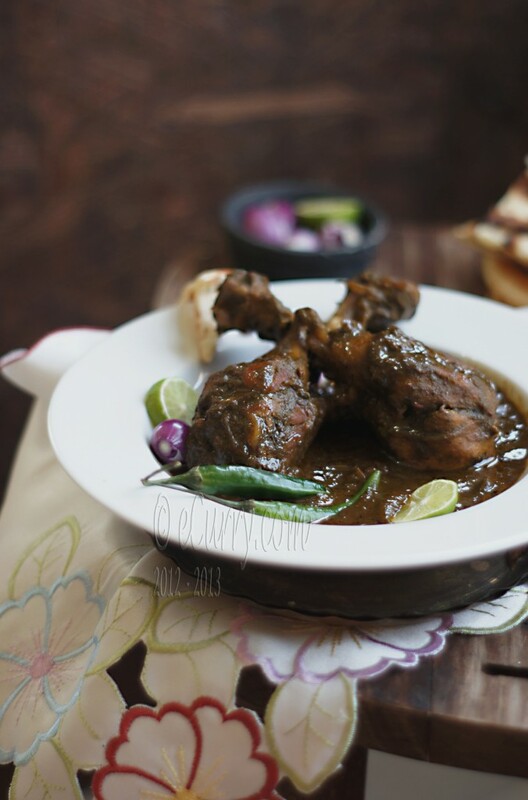 Serve with Naan/or Pulao and Pickled Onions. June 27th, 2012 | Category: Curries, Main, Entrees etc, Meat & Poultry, Sides & etc. A magnificent and original dish! That is a mouthwatering combination. OHHHHHH my word. This is so fabulous. I’m dying! Oh how I wish I stayed near you! Like you, I never grew up eating this dish, but have tasted it outside. I always prefered butter chicken over this, but your pictures…oh your pictures…make me want to dive right into it. love the plating and composition. amazing clicks as always! My first visit to your blog and absolutely love the clicks! The chicken looks so delicious I do want to reach out grab a bite! Do visit my blog , happy to follow you! It sounds and looks lovely, comforting but still very healthy. Perfect! You always manage to surprise me with these original dishes Soma. Well maybe they are not entirely original everywhere in the world but they are usually new to me! I love the look of this spinach chicken. Gorgeous pics too! Great site,like your recipes and photos,will be trying out some of your recipes . 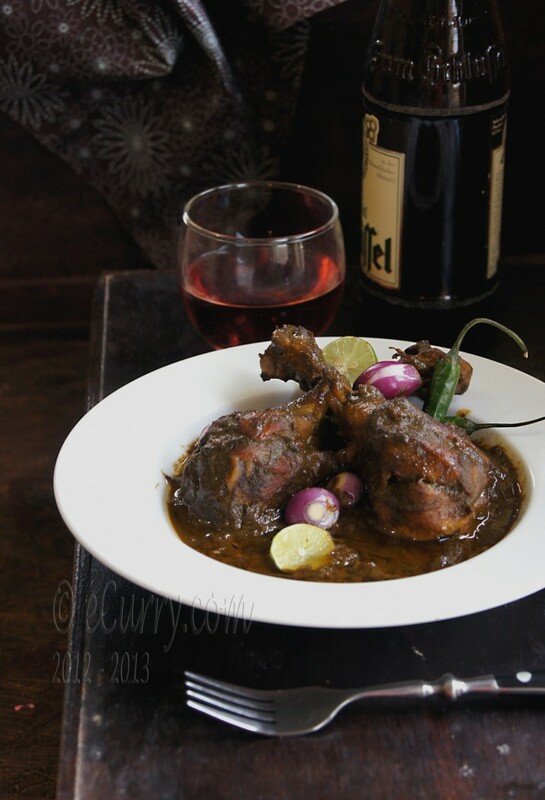 I made this last week and it was simply one of the best chicken dishes I’ve cooked. I only used breast meat but it turned out sensationally… Thanks again for sharing. It’s a beautiful recipe! the addition of spinach is mouthwatering. It is not evident either! My kids can also have it. Very Good Posting. I will come back often!